Evelina Palace Hotel is built in the typical Bulgarian architecture for the region and is furnished with much style, giving warmth and comfort of the entire atmosphere. 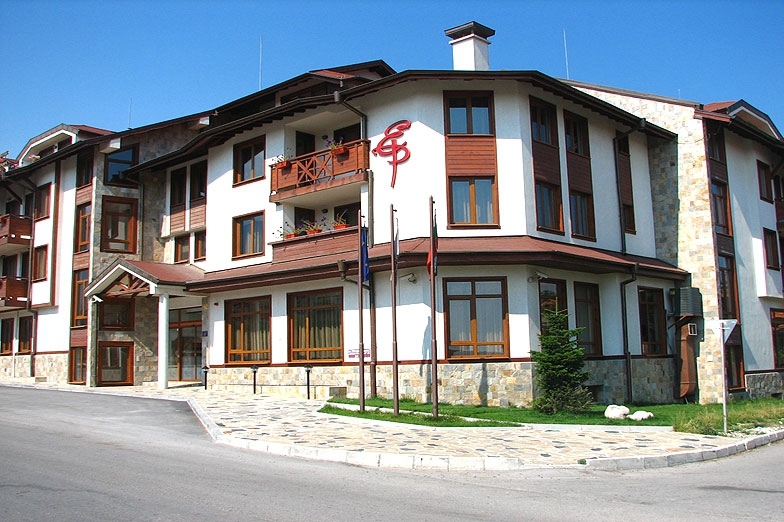 Evelina Palace Hotel is located on the main route for the cabin lift and is located against Bansko hotel and tavern Molerite. Just next to the River Glazne in the southern part of Bansko, about 5 minutes walk from the central square. Hotel Evelina Palace offers 42 double rooms, 3 suites, 2 apartments furnished, comfortable and cozy. All rooms have satellite TV, direct telephone, mini bar, hair dryer, balcony. The classic 90 seats restaurant in hotel Evelina Palace offers exquisite service and rich menu of Bulgarian and European cuisine. Evelina Palace offers one of the largest indoor pools in the area, supplemented by a child area, fitness equipped with PANATA devices, sauna and various massages. There are also solarium, Jacuzzi and Turkish bath. For the late hours of the day, the sports bar of the hotel waits you for a billiard play, darts or party with friends. In the beautiful summer garden of Evelina Palace Hotel with barbecue and children playground, you can indulge in pleasant rest in the cool summer evenings.